Heavy rain could not stop Kim Bok-dong, 92, from staging a solo protest in a wheelchair in front of the Ministry of Foreign Affairs in the thick of Monday's rush hour. The victim of Japan's forced sexual slavery is the first in a line of others to follow to protest against the establishment of the Reconciliation and Healing Foundation, a controversial state-run body for Korean sexual slavery victims built with a 1 billion-yen ($9.2 million) Japanese contribution. "It's only been five days since I had my surgery (for cancer treatment)," said Kim, wearing black-rim glasses and holding the picket against her legs. "But I was more upset staying in bed and had to come out and say something." She lambasted the former Park Geun-hye government for allowing the foundation to be set up in Korea, under a 2015 agreement between Seoul and Tokyo. Tokyo pledged to provide the funding for the foundation. 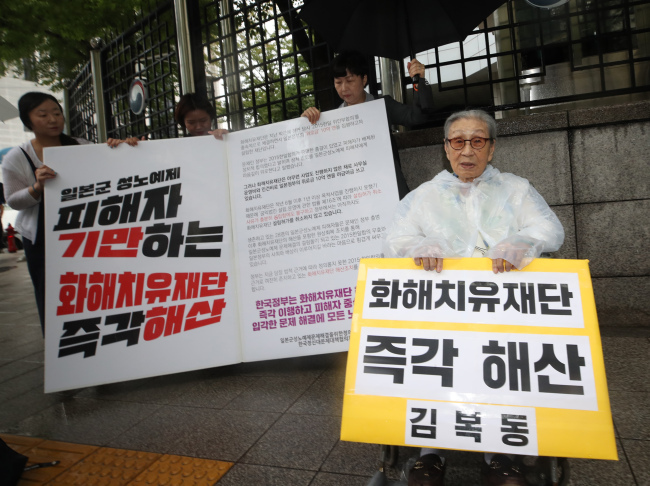 The agreement reached between Park and Japanese Prime Minister Shinzo Abe sparked a strong backlash from Korean victims and her political opponents. It also drew ire from the general public. Kim is among the 27 surviving Korean victims who were forcibly taken by the Japanese military to serve soldiers in brothels during the war. Korea was a Japanese colony from 1910-45. "We didn't fight for this just to get compensated. Offer us 100 billion won, we won't take it," she said. "We told the government to return (the money), and they're still not doing it." She urged the liberal Moon Jae-in government to take actions for a complete disbandment of the foundation. which has effectively stopped functioning amid the mounting backlash. Asking a Japanese correspondent at the scene to "deliver her message" to Abe, she called for Japan's sincere apology for its past actions during the colonial rule.